I remember it was Dr Hook who sang about being on the cover of Rolling Stone: they even got there. Well, I'm delighted to say that I finally made the cover of the RPS Journal Infrared Centenary Edition. 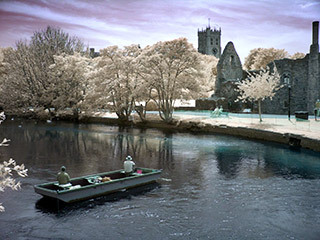 It's a faux-colour image taken in Christchurch in Hampshire last year. The colours have a little to do with real life but also to do with infrared leaking through the Beyer filtering on the sensor of my Sony DSC-F828 camera. The edition also includes Clive Haynes discussing infrared digital photography and a piece on the background to Professor Wood's 1910 and 1911 infrared photographs, by me.